Warmth and appropriate hygiene in handling newborns, early and exclusive breastfeeding, umbilical cord care, eye care, vitamin K administration, and immunization are all key components of essential newborn care (ENC). To reinforce these critical practices and build the confidence of providers, MCSP and partners (including the American Academy of Pediatrics, Laerdal Global Health, and Saving Newborn Lives) are working to introduce Essential Care for Every Baby (ECEB) in partner countries. ECEB is a newborn care module of the Helping Babies Survive series developed in partnership with the American Academy of Pediatrics, and is designed to augment existing ENC materials. 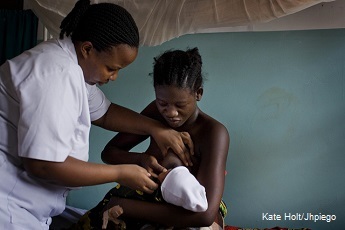 In addition to providing training in the ECEB series, MCSP works with key stakeholders in high burden countries to identify and strategize how ECEB can be effectively integrated into formal newborn care training for providers. MCSP also revised the ENC e-learning course, which is published on an open-access, global health platform by K4Health. The “Essential Steps for Improving Newborn Survival” course provides the latest research, technical knowledge, and best practices critical to babies surviving and thriving, and explores newborn health from a life-cycle perspective. By September 2017, 285 people with a variety of organizations from 41 countries had completed the course with scores of over 85%, showing that the course is reaching a diverse, global spread of newborn health actors. Additionally, the Program continues efforts begun under USAID’s predecessor Maternal and Child Health Integrated Program (MCHIP) to introduce and strengthen structured postnatal care home visits. This activity builds on evidence that community-based newborn interventions reduce newborn mortality, as well as findings under MCHIP that few countries are implementing that policy at scale despite having an established policy. MCSP uses these findings to inform additional operations research on postnatal care home visits for newborn survival and to adjust implementation strategies at the country level. In 2017, MCSP launched a new guidance document, Postnatal Care, with a Focus on Home Visitation: A Design Decision-Aid for Policymakers and Program Managers, developed by Saving Newborn Lives and MCSP in collaboration with USAID, the World Health Organization, and UNICEF. The document reviews evidence from published literature and lessons drawn from program experience, focusing particularly on home visitation strategies. In India, MCSP’s research project, “Achieving Effective Coverage of Postnatal Care Services in India,” continues to assess the enablers and barriers to postnatal care services to generate knowledge on how to implement a package of interventions to improve the coverage and quality of postnatal care within the existing health infrastructure.